These boot insulators slip right over your shoes or boots, keeping your feet warm so you can stay out in the woods, treestand, or blind longer. Windproof, water-resistant, and constructed of a polyester shell and liner the ArcticShield boot insulators are lightweight and packable. 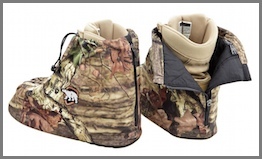 They will easily roll-up and fit into most pockets or backpacks to carry to your treestand or blind. They are a sure fit for any type of hunting or outdoor activity when you are sitting for long periods of time in cooler weather like ice fishing, sporting events, tailgating, and snowmobiling.